Please be aware that your tests may be photographed or videoed. Videos may be used for educational purposes. If you have any objection to this, please advise the organising committee prior to the competition. All events will be held in accordance with ANWE Rules and Conditions. The onus is on the competitor to know the rules. The conditions apply to all ANWE/CEI competitions. Riding on courses/arenas prior to an event will cause elimination. Competition Changes and Cancellation - In the event of the competition being cancelled prior to the event due to inclement weather, entry fees will be refunded less the $10.00 administration fee. These fees are non-refundable. The CEI website and Facebook pages will be updated in the event of change. For all changes after the closing date, all entered competitors will be emailed via Nominate. No horses are to be ridden at the competition or on competition grounds unless they are entered in the competition and the riders are financial members of EA or CEI club with current disclaimers. Day memberships will be available. Entries are taken on a first in basis and are only accepted via Nominate. From time to time there is the need to lodge a protest in relation to the results of a competition. In these instances, it is essential to follow the Protest Protocol in ANWE Rule Book 6.1. Horses may compete at any level HC (non-competitive) but may NOT compete at any level lower than its current competition level. One horse one rider. Horses may only compete at one level per competition. This sport presumes riders are right handed. If you are left handed or disabled, please identify the issue on the entry form. Riders wishing to ride HC (non-competitive) must declare their intention on their entry form. Callers are permitted. Riders in Working Equitation Dressage tests with callers will be penalised 2 points. Riders in Working Equitation Style phase with callers will incur a 5-point penalty. Riders may be changed at least 1 hour before the start of competition on notification to the Event Secretary. The new rider must be a current CEI financial member (day membership available). Horses cannot be changed. Draw position cannot be changed without the permission of the Organising Committee. One rider per horse for the entire event. All riders must be current financial members of CEI and must have a current ANWE NO. Draw: Every attempt is made to accommodate riders, horses and tests within appropriate time frames, and rider’s requests, as recommended by EA. However, the organising committee reserves the right to design the draw in the most appropriate manner to suit all competitors. The organising Committee has the final say regarding the draw and protracted discussions will not be entered into. The draw will be emailed to all entrants and available on the CEI website and FACEBOOK. Once the final draw is posted there will be NO CHANGES. If there are scratchings on the day, then horses may be requested to move up the draw. The Organising Committee reserves the right to delete any levels in any competitions in the case of insufficient entries. In the case of oversubscription, entries may be limited and taken in order of receipt. Scratchings will be accepted up to the closing date of the event. Full refunds, less the administration fee will be given if scratched before the closing date on nominate. After entries close, refunds of 50% will only be issued by providing a Veterinarian or Medical Certificate, provided to the Event Secretary within 24 hours after the competition. Ribbons are awarded for winners of the combined three phases in each level. Ribbons will be awarded as follows, depending on the size of the class. Up to 5 riders, ribbons to 3rd place, 10 riders, 5th place, 15 or more, 8th place. Champion and Reserve for all levels and teams. Ribbon will be awarded for the fastest cattle ride of the day! Gears checks are compulsory before each phase. Riders and horses must be checked by the gear steward prior to entry into the competition arena, and no changes of tack or attire are allowed for the duration of the competition (saddles and bits may be changed for the cattle phase). Elimination can occur if gear checks are not completed. Jackets may be optional at the rider’s discretion. Nosebands MUST be sufficiently loose to fit two fingers sideways. Failure to rectify a noseband that is too tight as directed by the gear steward or judge will incur elimination. Bits – as per the ANWE Rule Book and EA bit regulation – bits must measure 10mm in diameter. Riding in any of the tack listed below on the competition grounds on the day of competition will result in immediate elimination. Running/standing martingales, running reins, chambon, de Gogue, tongue ties, blinkers, ear plugs (may be used for presentations) or ANY equipment that the Ground Jury for the relevant competition determines is against the intent and general principles of Working Equitation. 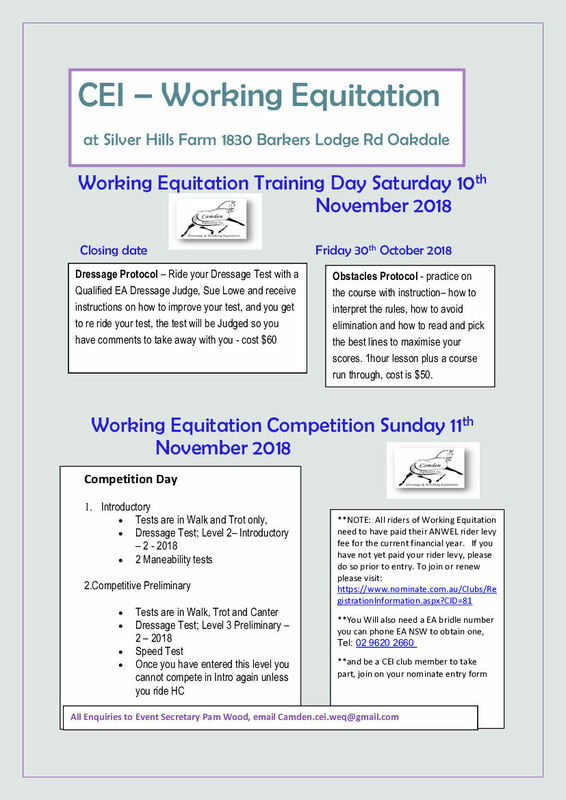 Please read the Rule Book on acceptable dress code for Competitions, ie; If you Ride in a English Saddle you must wear English Competition Clothes (or Club Shirt), If you ride in Western Saddle you must wear Western Show clothes (or club shirt).